Background: Laboratory request form is an important means of interaction between clinicians and laboratory service providers. The omission of information on the request form may result in laboratory errors which may have a negative impact on patients’ outcome. Objective: To assess the pattern of completion of laboratory request forms in a tertiary facility. Methods: Two thousand, two hundred and forty-one laboratory request forms sent to the laboratory over a period of two months were assessed for their level of completeness. Results: Out of 2241 laboratory request forms, only 5 (0.2%) was fully completed. The most complete information on the forms included types of investigation required (98.9%), the gender of the patient (97.8%), the identity of consultant-in-charge of the patient (95.3%) and the referring physician's name and signature (93.8%). The least provided information was the time of collection of the specimen (0.7%). Conclusion: This study shows that laboratory request forms are frequently incompletely and inadequately completed. Continuous medical education of clinicians on the need for adequate completion of request forms is required. 1. Bonini P, Plebani M, Cerioti F, Rubboli F. Errors in laboratory medicine. Clin Chem 2002; 48(5): 691–8. 2. Nutt L, Zemlin AE, Erasmus RT. Incomplete laboratory request forms: the extent and impact on critical results at a tertiary hospital in South Africa. Ann Clin Biochem 2008; 45(5): 463–6. 3. Carraro P, Plebani M. Errors in a stat laboratory: types and frequencies 10 years later. Clin Chem 2007; 53(7): 1338–42. 4. Plebani M. Errors in clinical laboratories or errors in laboratory medicine? Clin Chem Lab Med 2006; 44(6): 750-9. 5. Laposata M, Dighe A. "Pre-pre" and "post-post" analytical error: high-incidence patient safety hazards involving the clinical laboratory. Clin Chem Lab Med. 2007; 45(6): 712-9. 6. Scrivener R, Morrell C, Baker R, Redsell S, Shaw E, Stevenson K, et al. Principles for best practice in clinical audit. Int J Qual Health Care 2002; 15: 87-97. 7. Erasmus RT, Zemlin AE. Clinical audit in the laboratory. J Clin Pathol 2009; 62: 593-7. 8. Zemlin AE, Nutt L, Burgess CJ, Eiman F and Erasmus RT. Potential for medical error: incorrectly completed request forms for thyroid function tests limit pathologist's advice to clinicians. SAMJ 2009; 99(9): 668-71. 9. Sampath S, Bhatia K, Batra HS. Analysis of various errors in receipt of samples in the Biochemistry laboratory of aTeriary Care Hospital. Indian J Basic App Med Res 2016; 5(4): 280-4. 10. Plebani M. Exploring the iceberg of errors in laboratory medicine. Clin Chim Acta 2009; 404: 16-23. 11. Piva E, Plebani M. Interpretative reports and critical values. Clin Chim Acta 2009; 404: 52-8. 12. Oyedeji OA, Ogbenna AA, Iwuala SO. An audit of request forms submitted in a multidisciplinary diagnostic center in Lagos. Pan Afr Med J 2015; 20: 423. 3. doi:10.11604/pamj.2015.20.423.5778. 13. Jegede F, Mbah HA, Dakata A, Gwarzo DH, A Kuliya-Gwarzo. Evaluating laboratory request forms submitted to haematology and blood transfusion departments at a hospital in Northwest Nigeria. Afr J Lab Med. 2016; 5(1):a381. http://dx.doi.org/10.4102/ajlm . 14. Singh S, Khatiwada S. Assessment of Biochemistry Request forms. J Chitwan Med Coll 2015; 5(13): 18-24. 15. Burton JL and Stephenson TJ. Are clinicians failing to supply adequate information when requesting a histopathological investigation?. J Clin Pathol 2001; 54 (10): 806-8. 16. Klanl RA, Waheed U, Khan H, Zaheer HA. Audit of Laboratory Request Forms at a Tertiary Care Hospital of Islamabad, Pakistan. J Soc Obstet Gynaecol Pak 2016; 6(3): 133-6. 17. Kansay S, Verma M. Evaluation of request forms received in blood bank and biochemistry laboratory in a teaching hospital in North India: A comparative study of preanalytical errors. J Nat Accred Board Hosp Healthcare Providers 2016; 3(1); 20-6. 18. Adegoke OA, Idowu AA, Jeje OA. Incomplete laboratory request forms as a contributory factor to preanalytical errors in a Nigerian teaching hospital. Afr J Biochem Res 2011; 5(3): 82-5. 19. Olayemi E, Asiamah-Broni R. Evaluation of request forms submitted to the haematology laboratory in a Ghanian tertiary hospital. Pan Afr Med J 2011; 8(33). doi.10.4314/pamj.v8i1.71148. 20. Oladeinde BH, Omoregie R, Osakue EO, Onifade AA. Evaluation of laboratory request forms for incomplete data at a rural tertiary hospital in Nigeria. NZJ Med Lab Sci 2012; 66: 39-41. 21. Nigam PK. Serum Lipid Profile: Fasting or Non-fasting? Indian J Clin Biochem 2011; 26(1): 96–7. 22. Santoro N, Crawford SL, Allsworth JE, Gold EB, Greendale GA, Korenman S, et al. Assessing menstrual cycles with urinary hormone assays. Am J Physiol Endocrinol Metab. 2003; 284 (3): E521-30. 23. Moran VH, Leathard HL, Coley J. Urinary hormone levels during the natural menstrual cycle: the effect of age. J Endocrinol 2001; 170: 157–164. 24. Depasquale R, Crockford MP. Are radiology Request forms adequately filled in? An audit assessing local practice. Malta Med J 2005; 17(4): 36-38. 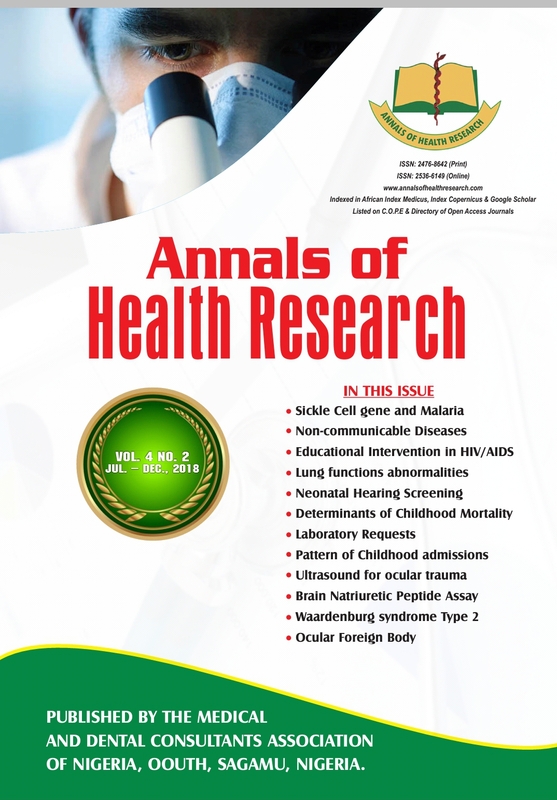 The articles and other materials published in the Annals of Health Research are protected by the Nigerian Copyright laws. The journal owns the copyright over every article, scientific and intellectual materials published in it. However, the journal grants all authors, users and researchers access to the materials published in the journal with the permission to copy, use and distribute the materials contained therein only for academic, scientific and non-commercial purposes. This journal is licensed under a Creative Commons Attribution-NonCommercial 4.0 International License (https://creativecommons.org/licenses/by-nc/4.0/). This license allows users to share (copy and redistribute in any medium or format) and adapt (remix, transform, and build upon) the materials published under this license for non-commercial purposes.